When watching my favorite game, I want to serve a substantial snack. Johnsonville Bratwurst is the perfect addition to your “Sausage Bowl”. Well seasoned and flavorful, these are going to fill the bellies of your hungry family and guests. I know for the big game coming up you are looking for unique foods to serve. Why not try substituting sausage for some of your traditional recipes. You could add browned sausage to queso for a nice change. Grilled sausage with peppers and onions are also another great item to serve up. Convenience is a key when throwing a party. Johnsonville Sausage is here to help you with your special event. I am going to show you one of my favorite game day recipes. I love wrapping pretzel bread around all sorts of sausages and hot dogs. It offers something substantial to your friends and family. Pretzel bread is very easy to make. If you have a mixer, you will not have to spend much time at all on making the bread. You won’t even have to knead the bread. A quick mixing of a few ingredients, and waiting for about 30 – 40 minutes to let the dough rise, and you are in business. You might wonder how you get the pretzel to get the lovely color. We are going to drop the pretzels into boiling water with some baking soda. Commercially pretzels are prepared with a food-grade lye that becomes food safe during the cooking. We aren’t going to use that; we are going to use baking soda. It works very well to get the flavor and color you will get when you order pretzels away from home. When making the pretzel wrapped brats we need to make sure the sausage is cooked fully before placing it into the dough. I like to cook my sausages in a pot of boiling water. I am going to cook these for several minutes on each side. Normally when the pan runs dry of water, I would let the sausages brown, here I am going to remove them and let them cool. I don’t want the sausages to overcook in the oven. When wrapping the bratwurst, you have some choices. You can wrap the sausages as a whole. I like to do this when this is the highlight of the event, or you can cut the sausages open, and then in half for smaller pieces. Pretzel-wrapped brats are an excellent way to serve these if you are serving a lot of other things at your event. It just depends on what you need for your party. 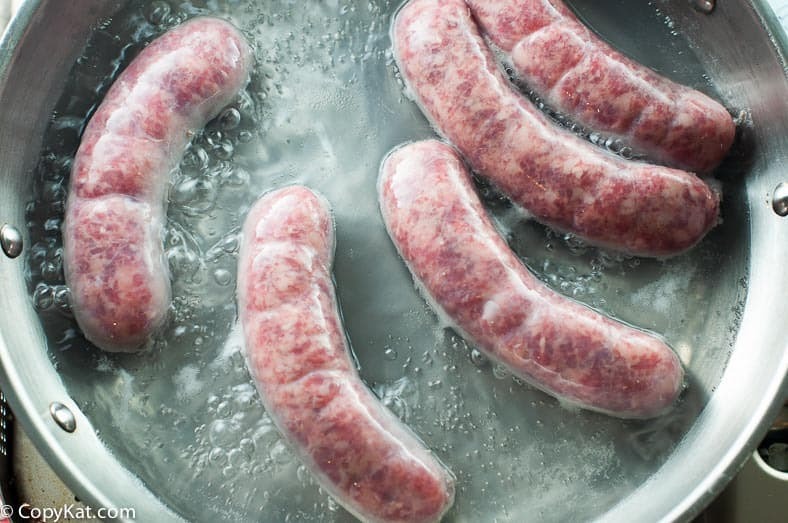 No matter how you cut your Johnsonville sausage, you will need to drop the wrapped brats into the boiling water with baking soda. I would use a deep pan and place a few wrapped sausages in at a time. You will need to cook these for about one minute. Then place your boiled sausages on a baking sheet lined with paper, and a quick spray with non-stick spray. The wetness on the pretzel will displace the oil on the cookie sheet. So I like to make sure they will lift off of the baking sheet easily. These will bake for about 15 minutes; you can leave them in the oven a little longer if you like your pretzels to get more browned. I will serve these up with some mustard, and you are ready to go. 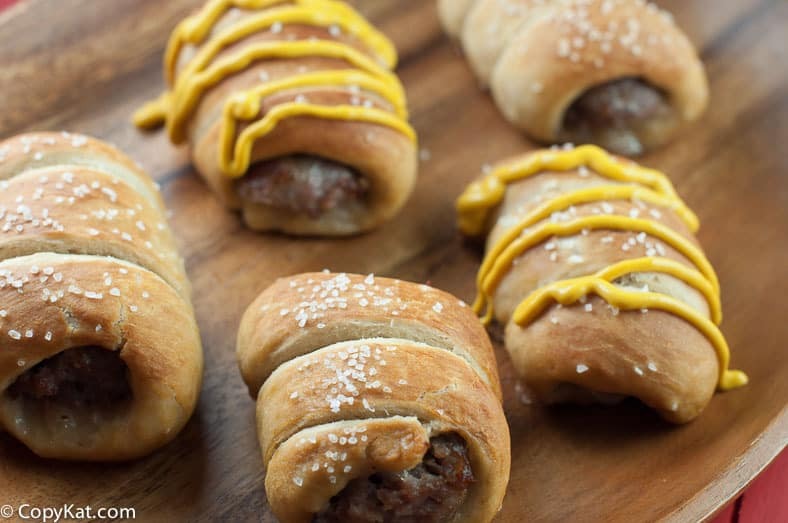 Pretzel-wrapped brats are so good for a party. Sprinkle yeast on lukewarm water in mixing bowl; stir to dissolve. Add sugar, salt and stir to dissolve; add flour and knead dough until smooth and elastic. It is ok if your dough is a little sticky. Place dough in a greased bowl, spray top with some non-stick spray and cover with a towel.Let rise at least 1/2 hour, the dough should double in size. While the dough is rising, place the sausages into a large skillet with about two inches of water. Cook sausage for about 6 to 7 minutes on each side. Preheat oven to 350 degrees. You can prepare the brats in two ways; it is easiest to cut the bratwurst in half lengthwise, and then in have so each link yields four pieces. 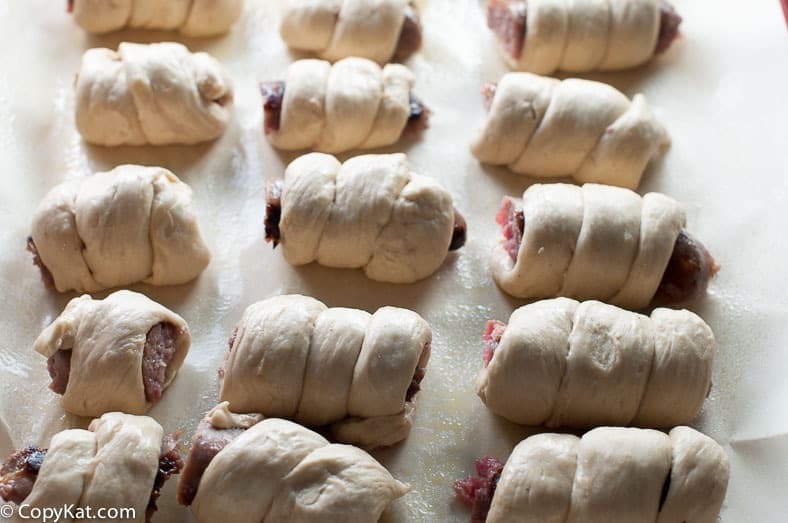 You can also wrap them whole; it makes for a meaty treat. They are harder to handle, but with some care, you can wrap them, and drop them carefully into the boiling water, and enjoy them prepared that way as well. 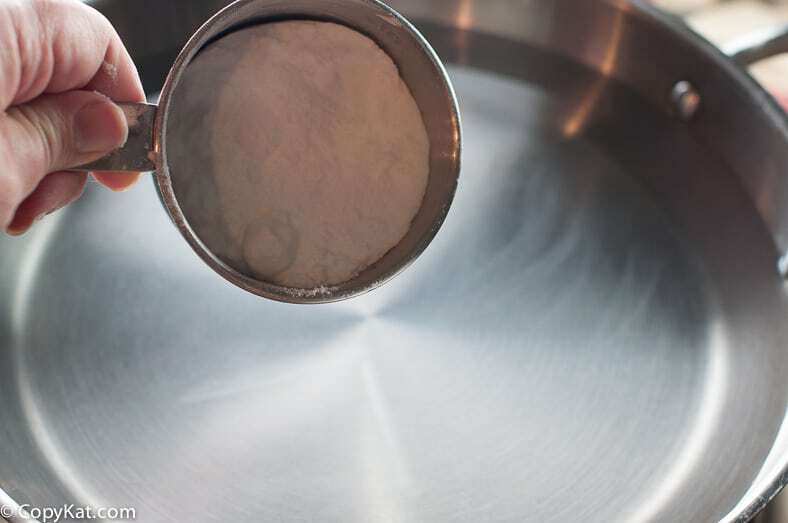 While dough is rising, prepare a baking soda water bath with 2 cups warm water and 2 tablespoons baking soda. Be sure to stir often. When the pretzel is wrapped, drop in for about 30 seconds. Remove boiled pretzel and place on a baking sheet lined with parchment paper that has been sprayed with non-stick spray. Sprinkle some coarse salt over the pretzel while it is still wet. Bake the pretzels until it are browned. The pretzels will take about 20 to 25 minutes to bake. Remove from baking sheet, and enjoy while they are still warm. Made these for the first football game of the year! We loved them. As an Ex-Wisconsinite, the home of Johnsonville Brats. We like to cook our brats in Beer rather than water. I use one stick of butter; half sweet onion, sliced and two cans of beer (I use n/a). Bring to boil the add brats. Fully immerse the brats in the beer. You’ll love the taste. I found Pretzle dough in can at Whole Foods. Made Pretzle sticks with them. They are cut in strips. 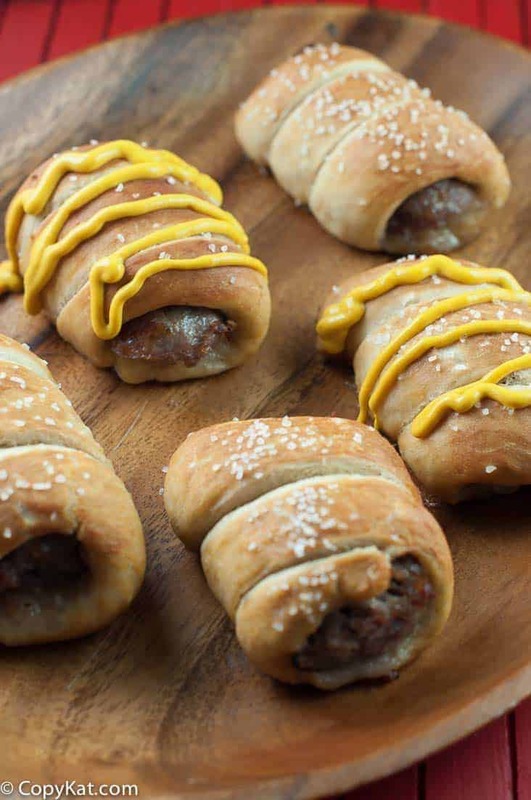 These look like a great addition to our super bowl party! I know that the kids and adults alike will enjoy them! This is the perfect appetizer for game day. IF the grocery stores were not packed with our looming storm warning I would go get some now.